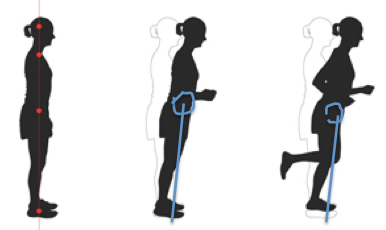 When you're Chi Running your center of body mass (Dantien) is ahead of your feet when you're in your support stance and you should feel like you’re gently falling forward as you run, but remember it is a controlled fall. So when you're in your one legged stance your center should be ahead of your feet. But if your Dantien is above your feet it means that you're pulling yourself forward with your hamstrings and you're not leaning and not taking advantage of the pull of gravity, assisted propulsion. Remember use the body sensing technique to feel like you're gently falling forward.